So apparently my space at Awesome Con is I-6, not 16. I’ll be in Artist Alley on the beginning of the row, next to Colorworld Comics’ Rachel Kelly! Remember, I’m at two events on Saturday! 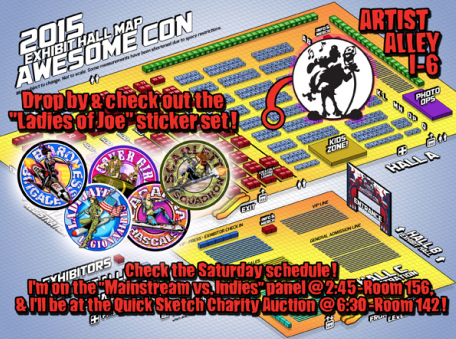 The first is the “Mainstream vs. Independents” panel at 2:45 in Room 156, and then later I’ll be participating in the Quick Sketch Charity Auction at 6:30 in Room 142!